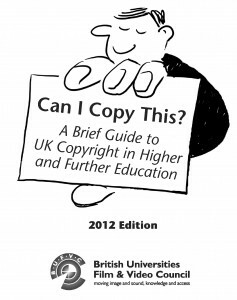 As the use of media in teaching and learning grows across universities and colleges throughout the UK, so understanding complex issues of copyright become increasingly relevant for the day-to-day activities of both students and staff. The British Universities Film & Video Council has, for many years, engaged with the issue of interpreting copyright law and worked for improved access to and re-use of moving image and sound for learning and research. Since the implementation of the Copyright, Designs and Patents Act 1988, higher education in the UK has benefitted from an expanded range of exceptions and associated licences. Now there are moves to revise UK copyright arrangements again – largely in response to pressures brought about from the widespread use of digital and online technologies for access, copying and onward delivery. Can I Copy This? by Murray Weston provides an accessible guide to media and copyright in UK education, detailing what works are protected by copyright, how to establish ownership within education, how to use third party content, legal exception, licensing bodies and much more besides. Murray Weston was Chief Executive of the British Universities Film & Video Council (BUFVC) from 1989 to 2010. !st edition published July 2012.